The Heidelberg Retina Tomograph (HRT) is an instrument for examining the posterior segment or the back of the eye. The HRT is suitable for predicting the risk of glaucoma in early glaucoma detection starting from the age of 40, for confirming a suspected case of glaucoma, and for following up with a confirmed case of glaucoma by monitoring change over time. The HRT provides the eyecare professional with crucial information for assessing the risk and for early treatment of glaucoma. You sit directly in front of the instrument during the entire examination. You will be asked to place your chin on the chin rest and your head firmly against the head band. The examiner sits to your side. You always look directly into the instrument, staring at a displayed fixation point. It is important that you blink normally to keep your eye from drying out. The examination is conducted on each eye and takes just a few seconds. When the examination starts, you will see a red square inside the instrument. That is the laser, which scans your retina in seconds. Rest assured that it is safe for your eye to look at the laser. The examiner will position the instrument’s head so that the entire laser beam enters the pupil. Then a green dot will appear next to the red square. You will be asked to stare at the green dot during the entire examination. 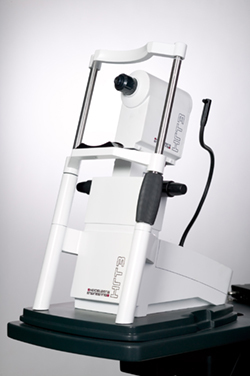 A laser scanner will scan the optic nerve head and the retina painlessly in seconds and create a surface map of your retina. The examination is completely painless for you and does not have any side effects. Contrast agents or pupil dilation with eye drops is not necessary. Afterwards, you can drive as usual, unless your eyecare professional has dilated your pupils to conduct a different examination.